Carved solid wood blades in walnut finish complete the look of this energy-efficient LED ceiling fan. 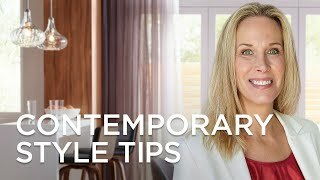 This has a modern look and great price! Also, love having a remote. I like the uncomplicated design. Like the look - reminds us of an airplane propeller and a boat prop. The size and the wood blades. Solid wood blades- and overall look. Has a very sophisticated look. It looks beautiful and the reviews say it is quiet. Why does this have a Prop 65? Is this an AC or DC motor? BEST ANSWER: Hi, the ceiling fan is an AC ceiling fan. It is an AC motor. Are the blades squared off or round at the end? BEST ANSWER: Hi - the blades have rounded flat edges, not tapered. Ours is installed indoors and is beautiful. I'm not sure if it is weatherproof. Can it be flush mounted? BEST ANSWER: No - the included 6" down rod must be used (minimum). No. Must have some clearance for air circulation. Our fam blades are about 14" from ceiling. I think that's the minimum. The "stem" is only about 4" long. BEST ANSWER: It’s shiny but not like chrome would be. It’s very nice. It’s truly a brushed nickel. i tried to attach a close up photo but I guess it’s not allowed. The wood finish is not shiny. What does it mean that the CFm only tested at 2017 when listed as 5723? Does this mean it has a low cooling effect? AS I"m looking for a good cooling effect. what color is the LED light? Daylight white or more Candlelight yellow? I turned the light on at 6:45am and I feel the light has a yellow cast. If you need more of a white light See I’d you can buy a different bulb. Can this be installed on a 15 degree pitched ceiling? Also, the point of installation on this pitched ceiling is 9'6". Would this require the 12" extension down rod? BEST ANSWER: Yes, this can be installed up to a 25 degree slope. Per the manufacturer, they recommend using a 12" rod for ceiling heights measuring 10 feet. Having trouble leveling blades. One blade is slightly higher the other two, so it wabbles on high. Any ideas on how to fix this? what is the width of the housing ? BEST ANSWER: Hi, the motor housing is about 7.5" wide. 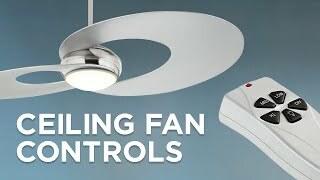 Can the fan speeds be controlled by a wall 3 speed switch vs the hand held remote? BEST ANSWER: Hi Hugh - no, the manufacture does not offer a wall control and the fan functions can only be controlled by the included hand-held remote control. Can a 12 inch down rod be purchased at a local big box store or is the rod specific to this fan? 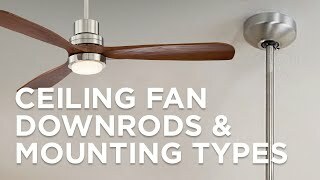 BEST ANSWER: No - the downrods available for this fan are specific to this model of fan and manufacture. 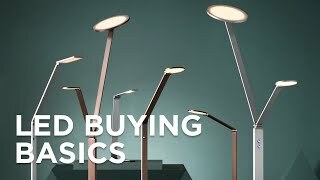 can the LED Lamp be replaced? Hi, can this be flush mounted? BEST ANSWER: No, this cannot be flush mounted. 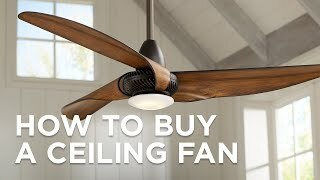 Does the fan have a speed control or is it 3 speeds. Can you make it slow down to a very low speed? BEST ANSWER: Yes, the ceiling fan has 3 speeds (Hi, Med, Low) and can be controlled by the hand-held remote which is included. It is 3 speeds. The slowest is slow, but no way of knowing whether it is slow enough for your needs. It works for me and I am not a fan of air blowing on me. We need an extra wall control. I was told by tech support that the included remote in cradle comes with two little screws so the cradle can be mounted to the wall. 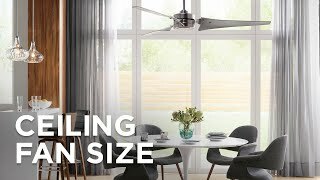 Can we buy a second remote like the one included with this ceiling fan? BEST ANSWER: Yes, please call one of our lighting specialists and they will be happy to special order another remote for you! BEST ANSWER: Hello - The distance from the ceiling to the bottom of the light is approximately 15". Thank you. Does this have a reverse fan function? BEST ANSWER: Yes, the fan is reversible. The manual reverse switch is located on the yoke cover. Yes it does, like most ceiling fans it has the switch on the base that reverses the fan. Do you sell the 72 inch down rod? BEST ANSWER: Yes, to order the downrod please contact one of our lighting specialists. Are there any option available to retrofit the fan to have 2 switche control from wall? IE: on/off for each - 1 switch for light, 1 switch for fan. Then if the the low/med/high needs to be adjusted, we would go back to remote. -or put fan speed adjust on the wall. Said another way, can we setup 2 switches to where we come in room to flip one switch for fan Light on/off and the other for Fan on/off? BEST ANSWER: Please contact our Casa Vieja/Possini Euro Design Customer Hotline 1-866-506-9326 for assistance with any installation or control questions. I don’t believe there is a way to retrofit this fan to a switch. It comes with no supplies to make it switch compatible. Maybe an electrician could rewire it but that sounds like a lot of extra expense without a guarantee that it would work. Sorry! 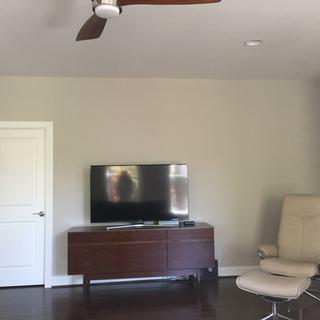 What is the minimum ceiling height for this fan? we have eight foot ceilings and I wouldn't want it installed on anything too much lower than that. What is the end rated lifetime on the integrated led bulb? 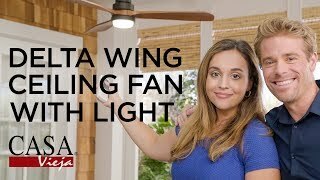 Does this fan come with a sloped ceiling mount option? BEST ANSWER: The Casa Vieja Delta-Wing can be mounted on a sloped ceiling up to a 15 degree angle. If the slope is greater than 15 degrees, you will need to purchase a sloped ceiling adapter. Using a sloped ceiling adapter, it can be mounted on a slope up to 25 degrees. You may also need a longer downrod to maintain proper blade clearance when installing on a steep, sloped ceiling. Longer downrods are also available for purchase. Since sloped ceiling adapters and downrods are special order items, we will need for you to call in and place the order over the phone. no it doesn't, but you can probably order it separately. You may also need to order longer downrods, sold separately. The lamps plus team was really helpful with these items. I ordered three of this fan, and it is beautiful! Can this be installed without the downrod? BEST ANSWER: This fan needs to be installed with at least the included 6" downrod. If you look at the last picture it shows the fan with the "very" short download. You do have to use the long or the short. The short is no more than 8" or so long. 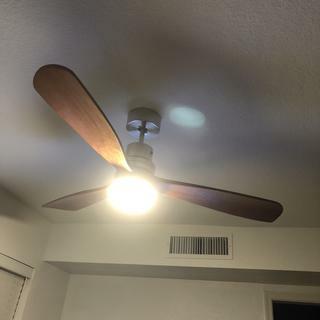 When the fan and light is shut off using the wall switch, then turned back on with the same switch it always resets to fan off and light on regardless of how it was operating previously. Why does it not remember the last settings when controlled from the wall switch, is this normal? BEST ANSWER: This is normal for any radio frequency controlled ceiling fan. Since the ceiling fan includes the remote system we recommend to use only the remote to turn it on/off. I have the same fans and issue. Are there any option available to retrofit the fan to have 2 switches control from wall? IE: on/off for each - 1 switch for light, 1 switch for fan. Then if the the low/med/high needs to be adjusted, we would go back to remote. Casa Vieja recommends the use of the Remote control system included. Can the blades be white? BEST ANSWER: Unfortunately, this ceiling fan is not offered with white blades. Do you sell a compatible wall mounted control for this light? BEST ANSWER: No, unfortunately not a wall control, just a remote control add on option. Can you get the nickel finish in a span greater than 52 inches? BEST ANSWER: Unfortunately, the nickel finish is only available in the 52" span. Can the bulb in the light be changed? BEST ANSWER: Hi - the LED light in this fan is built-in, so it can't be changed. Looks great and works great! We love it! Put these up in my new Sunroom, they look fantastic. We have 3 across and they fit beautifully. Very quiet and smooth. Great looking ceiling Fan. I highly recommend. Great looking fan. Highly recommend. Only downside is that the led light fixture is not very bright and obviously you can't replace the bulbs. But it's a very attractive fan and is very quiet. Orange not Walnut stain on blades. as it isn't really worth the $300 or even the $240 sale price we paid considering all the problems and defects. I was very disappointed with this purchase and returned it (Lamps Plus was great and even paid shipping to return it.) I spent a bunch of time installing only to find out that the unit I got was very loud, making a whining/whirring sound coming from the motor without the blades installed, so it wasn't a balancing issue. There is also the issue of the down-rod piece that only has two set screws instead of three. No matter what you do those two screw push the rod off to an angle when tightened. You have to have three set screws in order to center a rod and this fan explicably doesn't. It was very frustrating to install and then to have a noisy motor really ticked me off. I love the way this looks as well as how it operates. The fan blades are elegant looking and sturdy. I recommend highly. This fan is great looking but too loud. I had to pay an electrician to install/uninstall and replace one of these due to how loud the motor is (both of fans I purchased of this model are loud). The replacement is slightly quieter but still too loud for a bedroom. If you need a quiet fan, this is not the fan for you. If style is the only concern, it's a nice looking unit. 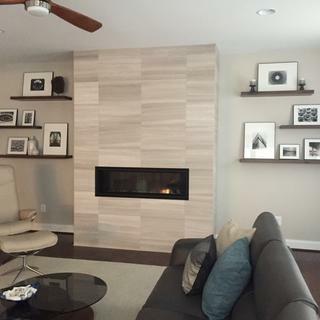 I love the modern look of the unit. I replaced a pull chain unit in my kitchen area so the wireless control means no more stretching over the table to turn on the fan/light. Installation instructions were clear enough and I did have to balance the blades. Looks great -- very bright! Moves a lot more air than the old fan and looks great too. We enjoy the fan, but not the glare of the light. We added a dimmer but it makes the fan buzz. The real wood blades are terrific looking. Hi Jennifer M., glad to hear that you are enjoying your fan. We do apologize if the light produces some glare, but please note that this design is non-dimmable. Please reach out to our customer service team if you have any questions or concerns. Thank you. 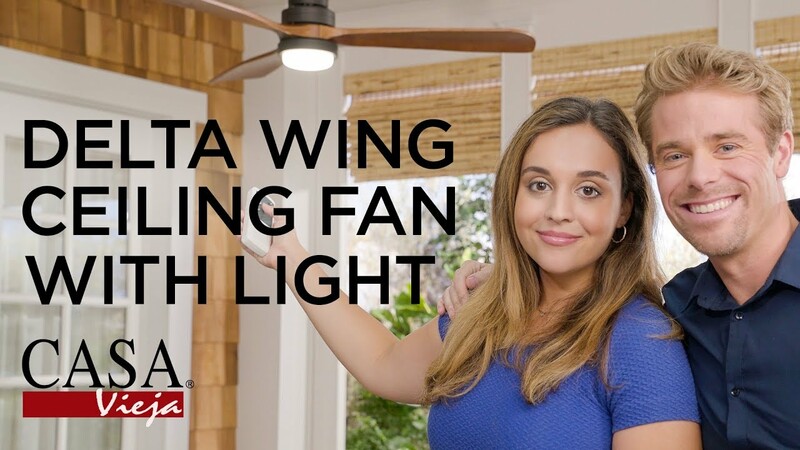 The Casa Vieja Casa Optima ceiling fan comes in a crisp white finish and offers plenty of refreshing power. 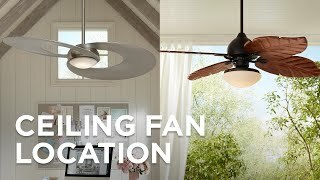 This low profileenergy efficientbrushed nickel ceiling fan features silver finish ABS blades and a full function6-speedhand held remote control.